Lovely, detached holiday home on a large, entirely enclosed, private lot. It was built approximately 200 years ago from local natural stone and has been entirely renovated. Outside you have magnificent views over the forest hills of the Causse de Gramat and a private swimming pool with covered terrace. This area is part of the Parc Régional des Causses du Quercy. In the north, it covers the area between the valley of the river Dordogne and the valleys of the Lot and the Célé in the south. Besides listening to the tranquility, it is also perfect for taking a walk straight from the house and enjoying the beautiful surroundings. 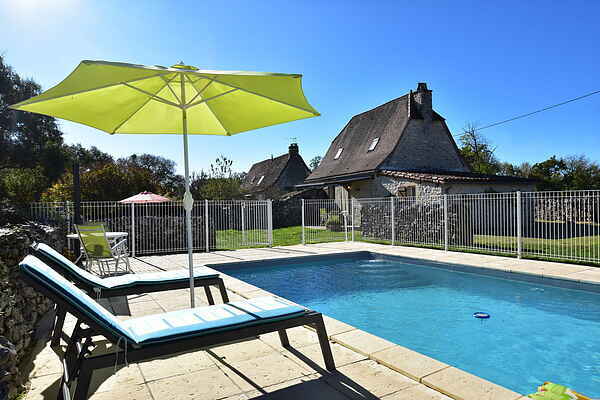 The holiday home is on the edge of a hameau with five other houses, at approx. 5 km from bustling Gramat. You can go here to get your groceries, rent a bike, and you will find restaurants, charming outdoor cafés and a lovely zoo. If you enjoy looking at monkeys, don't forget to pay a visit to the monkey forest nearby Rocamadour at just 7 km. You will be surprised by the beauty of the little village built against the rocks. A boat trip along the underground river Padiric and the sight of the beautiful medieval castles and cities is also quite unique.